Four women answer a railroad advertisement seeking single young ladies as brides for settlers on the Western frontier. The Bride Train carries them to a land plagued by violence and unrest…a place where passion rules…and only a woman’s touch can tame it into love. 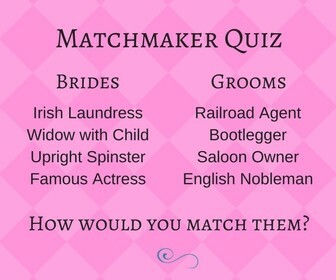 An English nobleman searching for riches, an Irish laundress seeking love… Only in American would Fate be foolish enough to put them together. A disabled veteran’s fortunes improve after he hires a beautiful and talented performer…but when her past catches up will his luck run out? An upright spinster is kidnapped to become the bride of a notorious bootlegger and finds an unexpected chance at love…if she’ll risk everything, including her reputation. The arrogant railroad agent must marry a proper lady to reclaim his inheritance, but the woman he wants despises him passionately. “BONUS!! 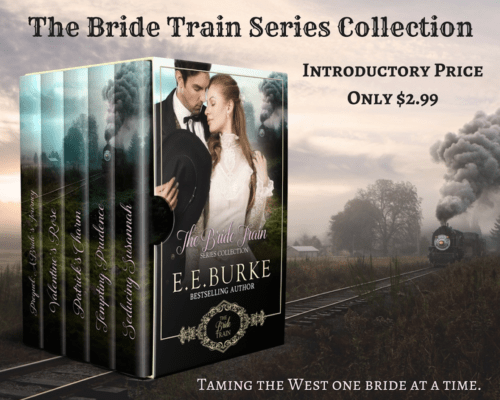 Prequel: A Bride’s Journey Enjoy this brief introduction to The Bride Train Series, which provides a glimpse into the journal of one of the brides traveling west. This series features a cast of characters taken straight from the pages of history. Why not try your hand at matching them? Who would YOU put together and why? 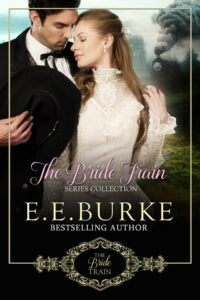 All four of the Bride Train books have become Amazon bestsellers, and Tempting Prudence won a readers’ and bloggers’ book award for Best Western Romance in 2016. Take a ride on the Bride Train out to the American West and fall in love! For a limited time, you can pick up SEDUCING SUSANNAH for only 99 cents. Ross Hardt must marry a proper lady to reclaim his inheritance. Among the few remaining prospects in town is a beautiful, sassy widow who has tantalized him from the day they first met—the same day she slapped his face. Susannah Braddock journeyed west on The Bride Train in search of a good father for her young son, but on the lawless frontier few candidates meet her requirements, least of all the arrogant, demanding, unfeeling railroad agent. As Fate—and Ross’s scheming—draws them closer, Susannah glimpses unexpected tenderness beneath his harsh exterior, and she’s tempted by the fiery passion that flares between them. But when a secret comes out that threatens to destroy their budding relationship, passion isn’t enough. Only love can weather the oncoming storm. SEDUCING SUSANNAH is Book 4 in an exciting series inspired by true events. Sweetly passionate, filled with wit and warmth–don’t miss this top-rated historical romance. Ross stood to stretch his legs. Needing to move, he crossed to the large picture window, which had been shipped in by railroad for a dress shop that had failed to materialize. The previous land agent used the glass for the land office instead. Ross enjoyed being able to see outside. He hated to be cooped up in a dark room. A petite woman walking briskly from the corner arrested his gaze. Susannah Braddock. He’d recognize her curvaceous form anywhere—or his body would, at any rate. Inconvenient, this strong attraction he had to a woman who despised him. Talk about first impressions. She’d made a hell of an impression the day she’d arrived in town, smacked his face so hard his ears rang. Granted, he had it coming after losing his patience and embarrassing her. Since then, he’d tried to find the right time and place to apologize, even stooping so low as to seek her out at church and sit beside her, hoping to speak to her afterwards. She’d shooed him away in front of the entire congregation. He ought to call it a draw and let her be, but he couldn’t. “Ross, there’s something I need to tell you.” Val’s solemn tone drew Ross’s attention. Why the look of concern? “No, she’s very well, thank you. She’s shopping. Rose won’t have time to stop by, but she sends her regards.” Val didn’t bat an eye or indicate he still struggled with jealousy. “Mrs. Braddock?” Val rose from his chair and joined Ross at the window. “Ah. I disagree. A determined woman can be very dangerous. Four women answer a railroad advertisement seeking single young ladies as brides for settlers on the Western frontier. The Bride Train takes them to a land plagued by violence and unrest, a place where passion rules and only a woman’s touch can tame it into love. 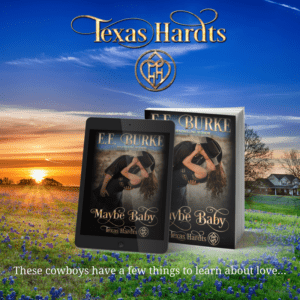 Say hello to Maybe Baby, the first installment in my new contemporary romance series, Texas Hardts. Jen Chandler can’t ignore the urgent ticking of her biological clock, no matter how many hours she puts in at work. The nesting instinct has kicked in big-time, and she wants a baby. After too many failed relationships, she isn’t looking for a husband. Instead, she sets out in search of a sperm donor to make her dream come true. Logan Hardt, a laid-back cowboy who shows up at her Atlanta home one day, turns out to have the right genes, as well as a pressing need for cash. But he’s seduced by more than Jen’s generous offer, and the closer the time comes to say goodbye, the less willing he is to honor a contract that would require him to walk away and never look back. Will a contract between them lead to more than a baby? Maybe. I’m over-the-moon excited to see that readers are loving Logan and Jen’s story. The series follows Logan and his brothers, as the Texas Hardts come together to save their family’s ancestral ranch. Ross Hardt must marry a proper lady in order to reclaim his inheritance. Among the few prospects in town is a beautiful, sassy widow who has tantalized him from the day they first met–the same day she slapped his face. 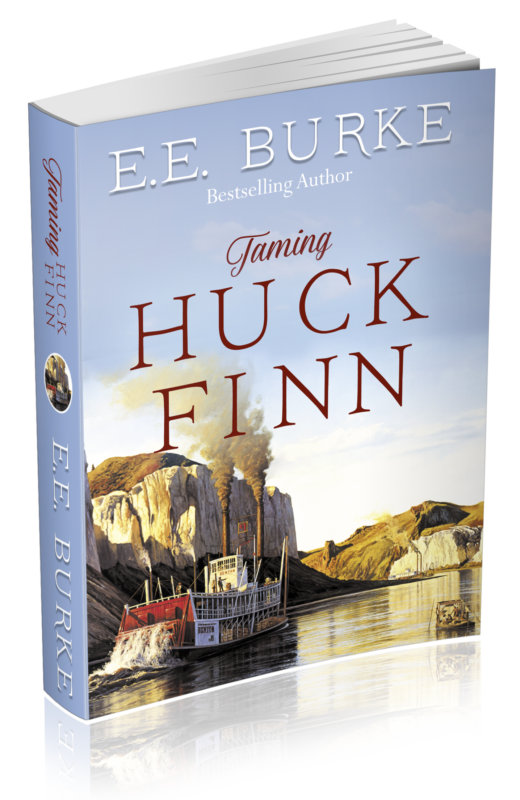 Susannah Braddock journeys west on The Bride Train in search of a good father for her young son, but on the lawless frontier few candidates meet her requirements, least of all the arrogant, demanding, unfeeling railroad agent. As Fate—and Ross’s scheming—draws them closer, Susannah glimpses unexpected tenderness beneath Ross’s harsh exterior, and she’s tempted by the fiery passion that flares between them. But when a secret comes out that threatens to destroy their budding relationship, passion isn’t enough. Only love can weather the oncoming storm. SEDUCING SUSANNAH is Book 4 in The Bride Train, an exciting historical romance series inspired by true events. Logan’s story will introduce readers to a sizzling new contemporary romance series coming out later this year, Texas Hardts. Do you know why it’s called the Double H? Both Hardt men explain in Seducing Susannah and Maybe Baby. The Double H brand might give you a hint as to the meaning. 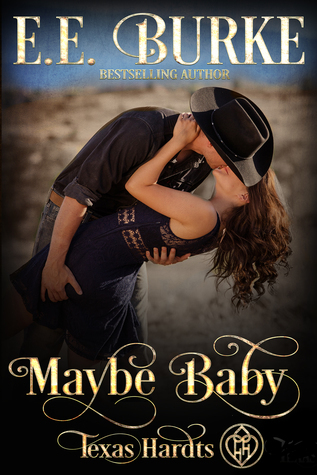 Click here to check out an excerpt from Maybe Baby. Giveaway ends June 20, 2017. She believes in nothing. He has nothing left to believe in, except his good luck charm. Lady Luck hasn’t been kind to Patrick O’Shea. The Irish immigrant has suffered loss, betrayal and bitter disappointment since arriving in America. When a talented performer shows up at his saloon looking for a job, it appears his luck is about to change. Charm LaBelle would rather take a job singing in a saloon than be forced to marry. The famous actress is on the run from danger and has learned the hard way not to entrust her life, or her heart, to any man…in particular, her charming employer. Patrick is determined to hold onto his good luck through whatever means necessary, including marriage. But Charm won’t give up her freedom or her secrets, and it’s only a matter of time before luck runs out. Read an excerpt from Patrick’s Charm. 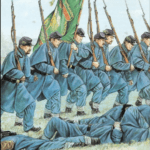 The Irish Brigade at the Battle of Fredericksburg. 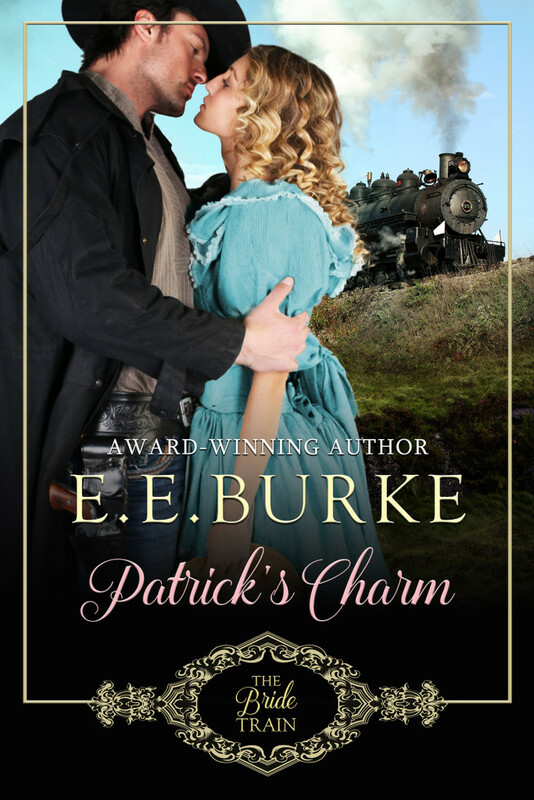 Patrick’s Charm features a disabled veteran and a runaway actress who both desperately need a lucky break. Researching this book, I learned a great deal about the Irish experience in America’s Civil War. While the war was raging in the early 1860s, the Union turned to the immigration docks for new recruits. These young men were signed up “fresh off the boat” and sent into battle, often with little understanding of what they were up against. This is how Patrick O’Shea starts his new life in America. Although he questions the wisdom of his decision to enlist, he nevertheless serves honorably, as did his countrymen, many of whom fought with the ill-fated Irish Brigade. Patrick’s permanent injuries are a constant reminder of his bad luck. Wounded soldiers were routinely dosed with opium for pain, and many of them, like Patrick, became dependent on the drug. 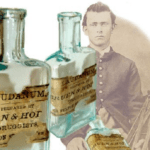 Opium addiction among former troops was so widespread it was given the name Soldier’s Disease. Imagine the strength it would’ve taken to cope with injury, addiction and the rigors of starting a new life on the frontier. I think you’ll find Patrick a fascinating character. Patrick meets his match in Charm LaBelle. Charm is a famous actress traveling incognito. She signed onto the bride train as a means of escaping danger with no intention of getting married. Instead, she takes a job as a saloon singer. Her decision has far-reaching effects. I won’t spoil the story by going into them. 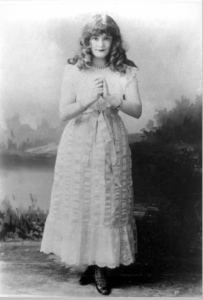 Charm’s character is loosely based on a famous 19th century actress, Lotta Crabtree, who got her start as a child, entertaining miners in San Francisco. Pursuing acting as a profession in America in those days required a great deal of courage and fortitude. Traveling through the wilds was bad enough. Performances were held in mining camps, saloons, and on makeshift stages. Only the famous few appeared in large theaters. Actresses who traveled the West were strong-willed and independent and certainly didn’t fit the mold of Victorian womanhood, which it made it difficult for them to find suitable mates or form relationships with women outside their circle. It wasn’t an easy life. In her impromptu audition, Charm sings two songs popular during the war and afterwards. One you might classify as a “fight song,” The Irish Volunteer. If you listen to this, you’ll want to jump up and dance like the men did at O’Shea’s saloon. The other, Lorena, is a ballad sure to bring tears to the eyes of former soldiers. It was great fun researching acts performed by traveling entertainers, which also included humorous skits created on the fly, and, surprisingly, lots of Shakespeare. Who knew the bard was so popular in the American West? Both Charm and Patrick have lived with tragedy, bitter disappointment and betrayal. Trust isn’t something that comes easily for either of them. Both are wounded in different ways. They must come together to help each other, and then, through love, find healing. ~ How about those gorgeous trains on my covers! The images were taken by award-winning photographer Matthew Malkeiwicz. He travels the country capturing relics of the steam era, and his work is simply amazing. You can see more of it on his website, Lost Tracks of Time.